I’ve been working on getting back into photography. I used to take a lot of great slides of surf trips and other travel but got out of it over time. I was into lazy picture taking, just typical snapshots. Now I’ve got the little Pentax Q7 and its re-energized me. I hope my pictures on C&C posts are improving as I’m trying to make a conscious effort. The biggest issue lately has been glare off the screen hindering creativity and that’s been a real pain. I’m now trying all my old glass from both 42mm screw and Yashica/Contax bayonet mounts in manual mode on the little mirrorless camera at a 4.6x magnification with a little adapting. My old 35mm lenses are now all various low light primes, tele and zooms because the f number doesn’t change. My Sun 80-240 f4 macro zoom just became a 368-1104 f4 macro zoom. Smaller lens like my Super-Takumar 50mm becomes a 240mm 1.4f. I’m happiest with my Yashica short zoom on it so far for wonderful macro shots and will share some more at a later time that I’ll take from the tripod. 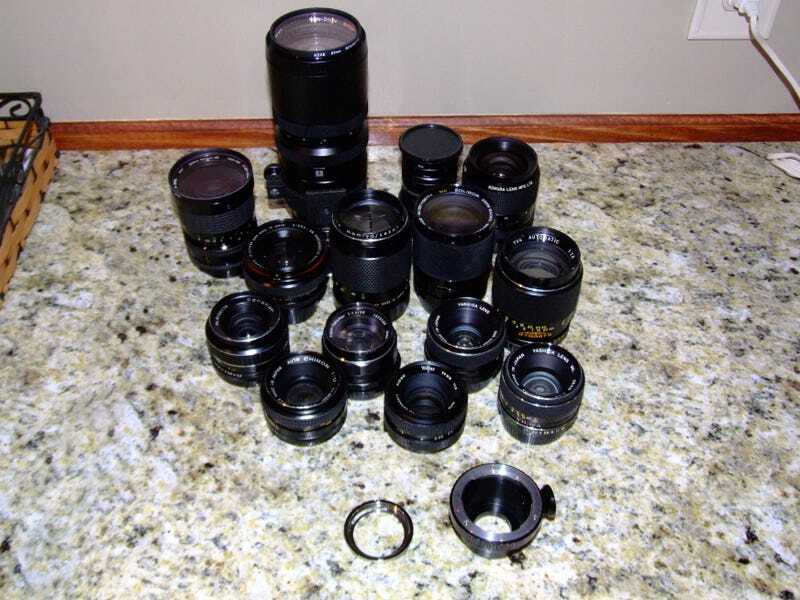 I’ve got to try the 24mm Vivitar and 28mm Yashica wides on it soon for 110mm and 128mm lengths at 2.8 and 2.5. The adapters I’m using are a Yashica/Contax to Pentax Q and a 42mm screw mount to Yashica/Contax to use any of this glass in manual mode. The same is possible on many other digital camera with lower magnification factors and larger sensors. It offers a whole world of experimenting with old lens of many makes and mounts. Pentax has a mount with full automatic capability with the Q7 of many of the Pentax family electronic DSLR lenses and I may get one of those at some point. The options seem endless so I’m also leaning towards a mirrorless Sony that I’ve seen spectacular results from. The one problem is making sure that the infinity focus is correct and the lens adapters still hold the rear of the lens off the sensors during the entire range of focus because some rear elements can move. This can vary from lens to lens and camera to camera so some web searching to see whats worked for others is essential. I must apologize for the crappy iPhone picture of my pocketable setup. Its had issues focusing well recently. This is the Pentax with fisheye, prime, short zoom and a Fujian 35mm 1.7f CCTV lens (161mm equiv) plus a CCTV C adapter. I can fit all these and almost any one of the 35mm lens in a much smaller camera bag or a couple of coat pockets when traveling or hiking. Its nice to have lightened the load. Its funny when I go to Cars and Coffee events that my larger old digital is only 9mp and does an okay job while this little thing is 12.4mp and does so well. People pay little attention to it and I feel it would be great for candid photos because its so toy like. Its great around cars to not be worried about a larger camera/lens that could screw up someones finish. The setup when adapting the larger lens are great for racing, hiking or birding pics. With just a monopod and a few pieces you can have a much lighter and less burdening outfit with a wider range of funtion than with a standard camera outfit. At some point I know I will get into that higher mp larger sensor digital camera of DSLR or mirrorless design and some other lens adapters. I’ve started the shopping but the variety of digital cameras than can be adapted is huge and its hard to make a choice. I’m leaning toward the DSLR Pentax because of the lens compatibility but it would be the priciest option. Not sure what I’ll snag in the future, but for now I have a bunch of playing around to do with all this stuff. Taken with a Y/C mount Soligor 28-80mm macro zoom at a massive magnification . These 3 shots were handheld and the white flowers are 1/4" across or less. The purple flower is a petunia. One more shot. The focus is super sensitive and I need to do a series of shots on the tripod with an electronic release for better sharpness. I’ll post some more stuff sometime as I experiment with this. I may run some film through my old 35mm cameras too.